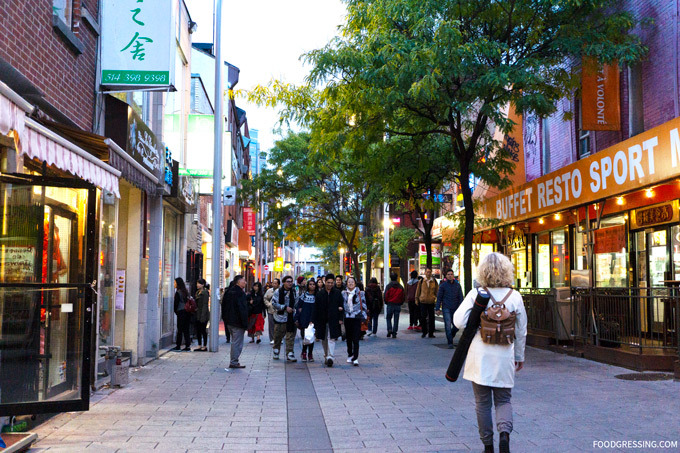 One of my most memorable eats in Montreal a few years back was a shop in Chinatown dedicated to making and selling Dragon’s Beard Candy. 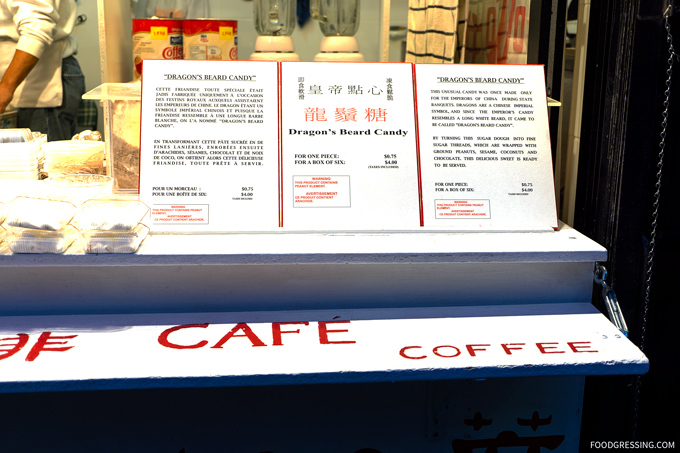 The store is called Bonbons à la Barbe de Dragon or Dragon’s Beard Candy. 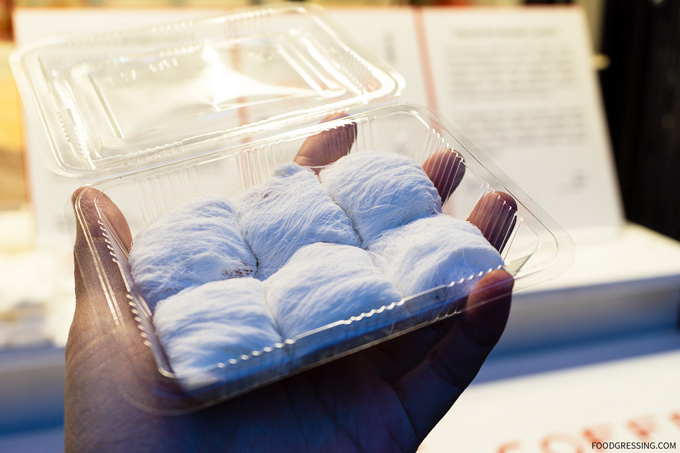 Making Dragon’s Beard Candy – a sort of Chinese version of cotton candy but with filling – is a handmade art. This Montreal shop is owned by Johnny KF Chin who makes the candy where customers can watch the process. It’s very unique to sell a storefront selling Dragon’s Beard Candy in Canada. Here in Vancouver, I only see it being sold at vendors who set up during special events like the Lunar New Year Festival and nRichmond Night Market. Dragon’s Beard Candy dates back to the Han Dynasty in China. Legend has it that an Imperial Court chef entertained the Emperor by showcasing the process of making the candy. This involved stretching a dough made of rice flour and sugar into small, thin strands. These strands resembled a dragon’s beard and were sticky enough to literally stick to your face easily. Hence, the candy was named Dragon’s Beard Candy. 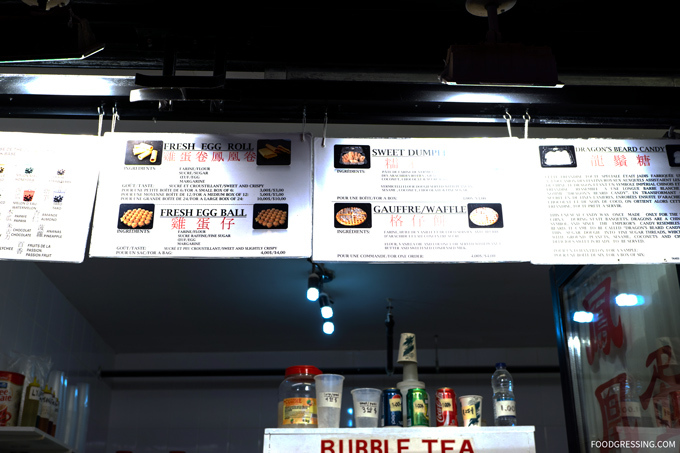 Aside from Dragon’s Beard Candy, this store also sells fresh egg rolls, bubble waffles, sweet dumplings and bubble tea. I really enjoyed the Dragon’s Beard Candy which had a delicious filling of peanuts, white sesame seed, coconut and chocolate. The thin strands were wonderfully delicate and tasty. PRO TIPS: Dragon’s Beard Candy is highly sensitive to moisture so depending on the humidity of where you are it is would be highly recommended to consume it as soon as possible. Due to the sticky nature of the candy, it would be best to eat it in more than one bite. Otherwise, you’ll find the candy to be quite sticky inside your mouth! 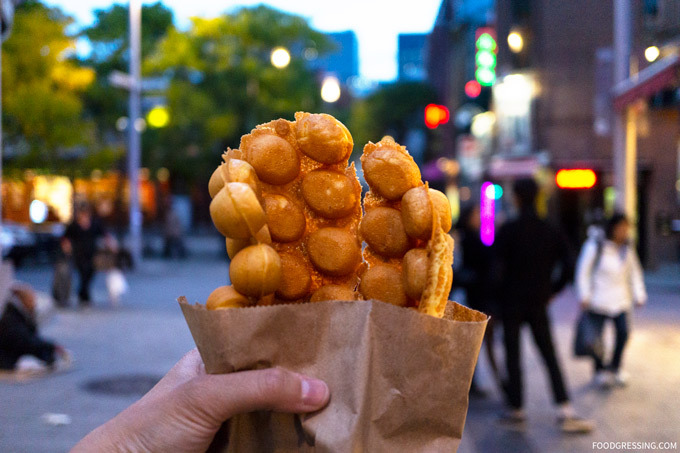 The bubble waffle was pretty good to being crispy on the outside and properly cooked on the inside.